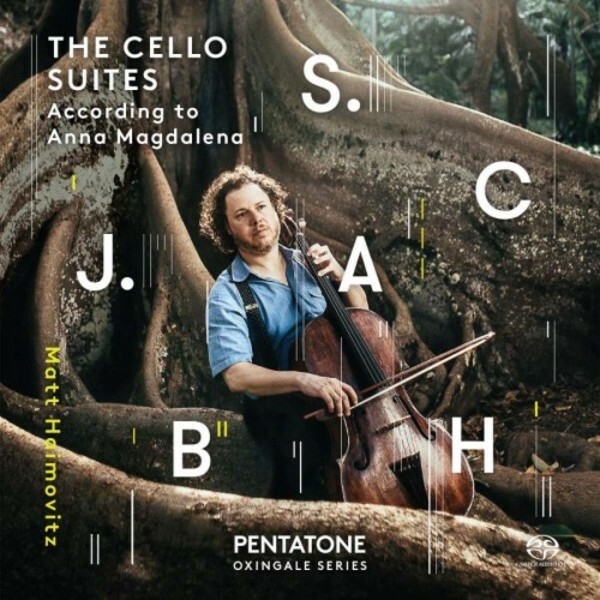 Fresh off the heels of his revelatory period-instrument recording of the complete Beethoven Sonatas and Variations with Christopher O�Riley, Matt Haimovitz releases 'J S Bach: The Cello Suites according to Anna Magdalena' on baroque cello and cello piccolo, the five-string instrument for which Bach�s Suite VI was likely intended. The original manuscript of J S Bach�s 6 Suites for Cello Solo has been lost to history. One of our only apostles is a copy made by Anna Magdalena, Bach�s second wife, her handwriting uncanny in its likeness to the composer�s own. Since 1890, when Casals found a published copy in a second-hand music shop and first performed the suites in public 20 years later, the suites have been both Bible and Holy Grail of the solo cello repertoire � each cellist searching for his own way into the heart of this music. Cellist Matt Haimovitz has been closely associated with the Bach suites since the year 2000, when the former child prodigy jump-started the alt-classical revolution by performing the complete cycle in folk clubs and rock venues, including New York�s now-defunct punk palace CBGB�s. That same year, he released a 3-CD set of the Suites that launched the newborn Oxingale Records. Now, 15 years later, Haimovitz returns to the Cello Suites with a stunning new interpretation, intimately informed by Anna Magdalena�s manuscript and the tools of the time.